American Automobile Association (AAA) is a federation of regional auto clubs throughout North America that provides roadside assistance to its 55 million members. AAA chose SmartAction as a preferred provider of voice self-service when their first Emergency Roadside Service (ERS) solution was introduced. Since then, more than a dozen AAA & CAA clubs have utilized SmartAction’s conversational Artificial Intelligence (AI) to automate more than 10 additional complex processes in the contact center. This suite of solutions has allowed participating clubs to increase contact center efficiency and agent productivity while retaining high Customer Satisfaction scores. The core of the auto clubs’ business is roadside assistance services, such as flat tire repair, lockout assistance, and towing, provided 24/7/365. ERS is one of the many engagements that is still primarily initiated over the phone. This presented unique challenges for AAA clubs. For example, during extreme weather and/or heavy travel times, certain clubs can receive up to ten times more calls than on a regular day, putting a strain on the call center. Many members were facing long queues and significant hold times before they were connected with an agent for help. Holidays can be planned for, but bad weather often hits unexpectedly, making it challenging for call center administrators to staff up accordingly. This challenge is magnified when agents are needed for every inquiry, as agent calls naturally take longer than automation, leading to longer hold times and tapped agents. In addition, AAA clubs strive to maintain high Customer Satisfaction (CSAT) scores with quick and easy service. A self-service strategy that satisfied member experience goals, as well as budget plans, proved hard to find. Contrary to the high cost and ongoing expense of the traditional professional services model, SmartAction’s cloud-based “AI-brain” was purpose-built for the contact center, with templates that support every industry and pre-built components that service hundreds of call types and chats from order management to roadside assistance. This made it quick and easy for AAA clubs to implement natural language understanding with zero professional services within an affordable, predictable usage pricing model. After customizing SmartAction’s proprietary “AI-brain” to support AAA clubs’ specific needs, AAA was able to introduce AI automation sooner than expected. Since every SmartAction solution includes a suite of services and benefits as part of the per-minute-usage, AAA clubs now had a dedicated team of CX experts that provided ongoing customization, tuning, and enhancements to the application for improved process and containment over time. While on the phone with ERS, SmartAction’s technology triggers an outbound SMS text message. The message contains a link that uses GPS to pinpoint a caller’s exact location. 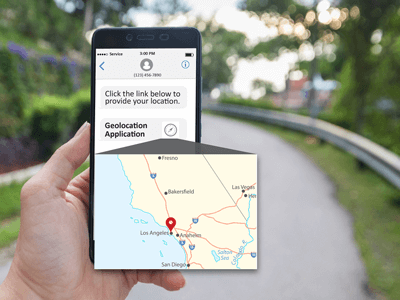 If members are having trouble identifying their location while on a mobile phone, SmartAction’s technology triggers an outbound SMS text message. The message contains a link that uses GPS to pinpoint their exact location—all while remaining on the ERS call. These capabilities allow clubs to provide self-service for a significant portion of ERS calls, offering quick and intuitive service without the need for a live agent. As a result, SmartAction handles more than 550,000 ERS calls every month for AAA clubs, providing self-service without any initial hold times. More importantly, when bad weather hits, the automation scales to manage peak volumes. This has helped AAA club call center managers reduce agent stress, leading to reduced turnover, an unexpected and valuable benefit. ERS applications can be configured and launched in eight weeks or less, providing immediate returns for new clubs. The ERS solution decreases cost-per-call by up to 50%, and in CSAT surveys, automation scores as high as live agents—4.5 out of 5. AAA clubs that have introduced intelligent automation understand the impact of contact center AI, and use the enhanced technology to differentiate themselves by providing member-centric experiences that are both innovative and cost effective. Should You Be Using AI to Improve Customer Service? Statistics Say Yes.